Defense – Obstacles Part V: More On Slowing The Threat Down on Roads and Trails. I’m sorry it’s taken so long to get this next entry up but life has been eating my time up. Anyhow in this entry we’re going to look at a couple of other ways to “block” a road and slow down traffic. Now when I write blocking a road remember some of the basic tenants of obstacles. A determined and capable threat is only going to be slowed by an obstacle. Obstacles can also slow your exit from the area down as well if you have to shag out. In this entry we’ll focus once again on stopping what will probably be the first type of threat we’ll likely encounter – a four wheel drive pickup full of dirtbags that have expanded beyond the picked clean towns to raid rural areas. Also note these obstacles are calculated based on the performance characteristics of an HMMWV which is really representative of a good 4×4 pickup. First up is a standard pole driven into the road. This can be something as simple as a section of telephone pole, section of tree, or even a piece of railroad rail. And as always the red arrow represents the direction of threat travel. To really be effective we need to have as much anchor in solid ground as possible. I recommend a minimum of 4 feet. That’s quite a job using post hole diggers or a shovel however an auger on the back of a tractor makes it a simpler task. Also you want at least 3 feet above ground. That will more than impact the undercarriage of most jacked up trucks. Anything extra in height is probably a waste unless you already have the posts pre-cut. If you use railroad rail for this make sure you put the flat edge facing the direction the threat is coming from. That gives the greatest contact area with the vehicle and also presents the greatest area of force against the ground if they try to push it over. To be effective these really need to be no less than 4 feet apart – 3 feet is better. You can run steel cable between them to impede motorcycles and other vehicles but with an unobserved obstacle that’s nothing more than a nuisance to light vehicles like bikes and ATVs. Next up is a another form of Abatis using poles in a manner kind of like a “pike”. This design is based on a medieval design that would stop horses and cavalry from advancing. For our purpose we’ll use it to create damage on any vehicle that runs into it. When you dig one of these in you want the base of it at least four feet deep and the post itself at a 45 degree angle with the tip between 18 and 36 inches from the ground. By cutting a point on the end and painting it dark grey or black if someone hits it blasting down a road in the dark they’re going to trash their vehicle pretty badly. Plant it deep and firm enough and if the vehicle is going fast enough when it hits it there’s a chance the occupants are going to get some pretty serious injuries as well. When you put these in it’s a good idea to plant them in a pattern similar to what the illustration below shows. On a 12 foot roadway plating them 3 feet apart in three staggered rows that are four feet apart you can get by with 13 poles. Make sure you take a good look at the soil composition before you start digging. If it’s really soft then once the first row is impacted there’s a possibility of the second and third rows being displaced. That can be fixed by increasing the distance between rows. If you use the “pike” type setup combined with wire in and around it you have created the other form of an Abatis which is pretty effective against dismounts. We’ll cover that later in wire but for now we’re focusing on vehicles. This type of patterned obstacle is also highly effective when combined with the natural choke point of a bridge. Put in on the approach and exit of a bridge combined with an abandoned vehicle (like in the last entry) it gives the threat a pretty good compounded obstacle to deal with. 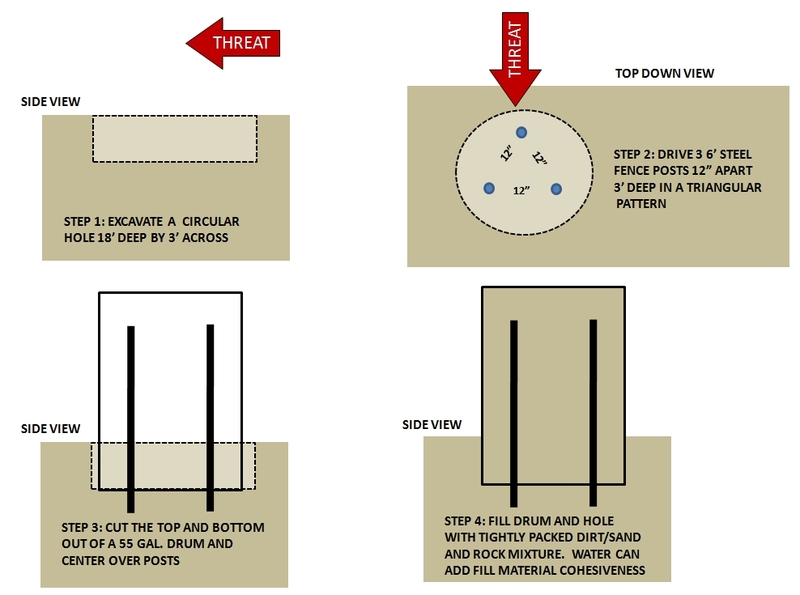 Another useful option can be created by using three steel fence posts and a 55 gallon drum. This type of obstacle is pretty darn effective. I’ve seen a truck hit a very similar setup doing about 40 miles an hour and bounce off while creating only minimal damage to the drum setup itself. The driver lost a few front teeth and got a pretty good concussion out of the deal even wearing his seatbelt. The first step in constructing this is to dig a hole at least 18 inches deep and larger in diameter than your 55 gallon drum. 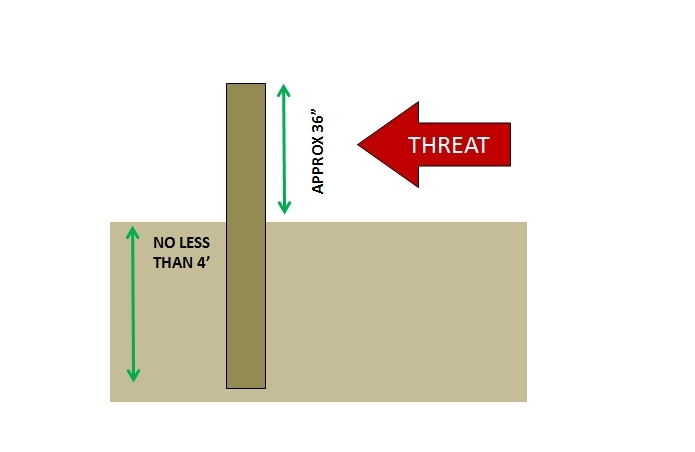 Then drive three steel fence posts 12 inches apart in a triangular pattern with the leading one facing the anticipated threat approach. You want these in a minimum of 3 feet but 4 feet is better. Then cut both the top and bottom off of the drum and set it over the posts with the triangle you’ve created centered inside of it. Now fill it with sand or dirt (or both) and rocks ensuring you bury the outside of the barrel as well. The fill needs to be tightly packed as you go and wetting it will help create a “poor man’s concrete”. A little bit more work but if you have the material or need an alternative it’s doable. With this design it’s good to use at least 6 foot long posts but seven or eight feet is even better. If you put them in using the staggered pattern above they’re going to stop a pretty fast moving vehicle. Are they impervious? No. A truck or tractor with a blade or dozer and some manpower is going to be able to cope with them. However they will slow, delay, or force the threat to take another route. Now say we don’t necessarily want to block the road completely but slow the approach of a vehicle down. This is where a device called a “log hurdle” can come into play. A log hurdle is an obstacle that is composed of a single or group of logs or poles laid on the ground and held in position by posts in three areas. 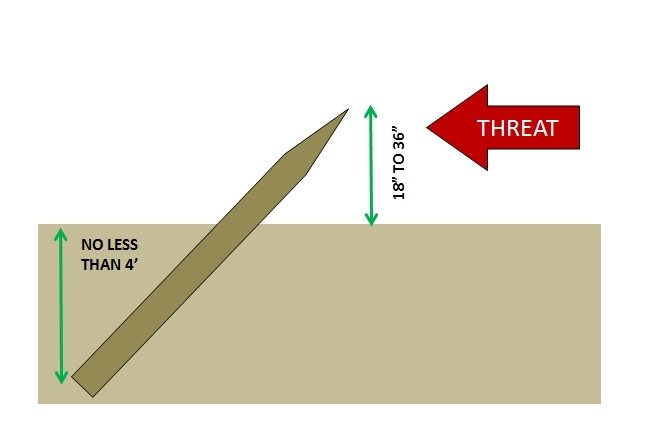 The illustration below depicts a typical log hurdle. 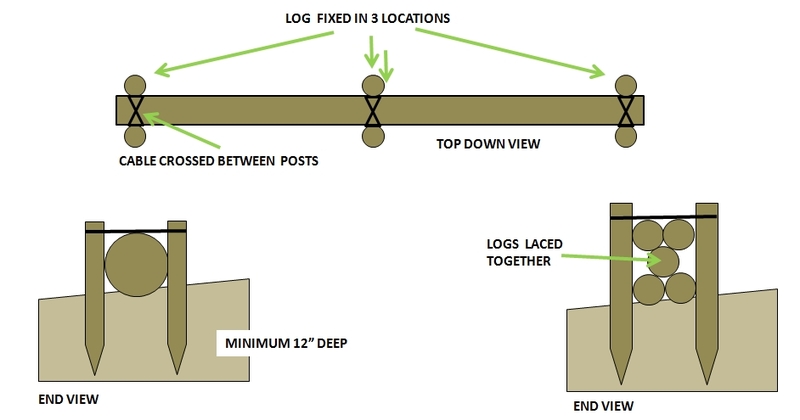 Notice that the log or pole is held in place by posts in three locations. The center set of posts keep the log from being swept aside easily if one of the end sets fail. Additionally the posts in each set are wired together to help hold each other and the log in place. It’s better to use a figure eight pattern when tying the posts together as that will give them a bit more stability against side force. You want at least a log large enough (normally 10 inches in diameter) to prevent a four wheel drive vehicle from climbing the hurdle easily. If you don’t have enough you can also combine logs to create a larger obstacle as shown in the bottom right of the drawing. Note when you use multiple logs or poles make sure you lace them them together by winding your wire or rope in and amongst the poles. That keeps someone from easily reducing the obstacle by lifting individual poles out and delays them further by forcing them to have to cut them apart before trying to reduce the obstacle. Unless this obstacle is tall enough it’s not going to stop a four wheel drive truck or tracked vehicle. Ideally 3 feet in height is going to be good enough to stop most wheeled vehicles. It’s also a good idea to dig the main log or group of logs into the ground at least a few inches (6 inches is better). That helps prevent them from easily rolling. One interesting fact is that log hurdles on a steep incline will stop most military type tracked vehicles from advancing as well. Good to know. Some key things to look at when putting a slalom in is that you have to prevent a vehicle from easily bypassing it (and you need to still have enough room for a vehicle you want to come in to move around them. Normally that works out to about 25 feet between them but you can reduce that distance some if you want to create a really challenging course. The goal with this kind of obstacle is to not allow a vehicle a direct shot into your area. It also creates a “capture zone” by reducing the amount of space a threat has to withdraw if they suddenly change their mind about assaulting your position. That capture zone gives you more time to bring fire upon a threat as it’s trying to disengage and retreat. A slalom can be as complicated as what is displayed in the graphic or as simple as two or three log hurdles and a bypass. 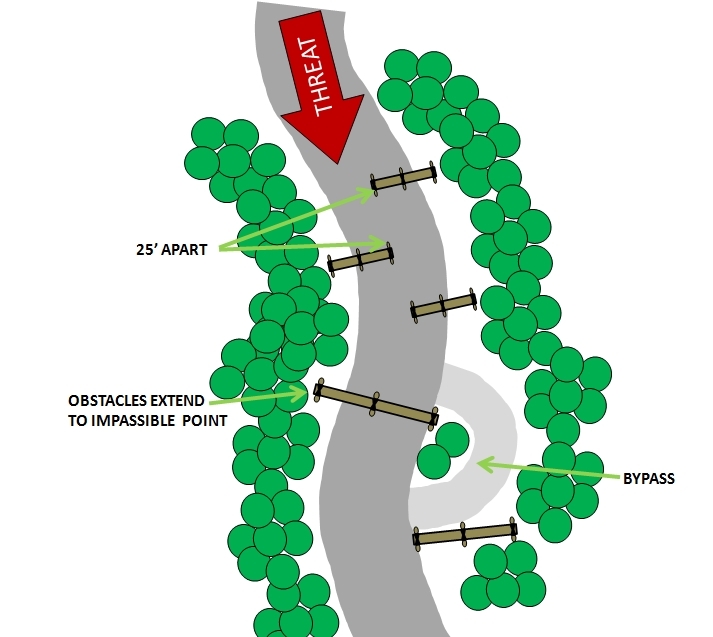 Notice the road is completely blocked at the bottom and an approaching vehicle would be forced to take the bypass around the last log hurdle to gain entry. You want that bypass to be a fairly tight turn so a vehicle has to really slow down to make it. Slaloms are probably a waste of effort away from the homestead unless you have some kind of manned checkpoint. Instead they’re probably better used to control immediate access to the homestead itself. You can mix and combine these different types of obstacles to get the results you desire. Rather than constructing a log hurdle to fill a small space maybe a pole obstacle would be easier. Use your judgement and some creative thinking to achieve your goals. One obstacle I didn’t cover and I have been asked about is a log crib. This is basically a complex structure of logs that creates a couple of interlocked walls and is filled with dirt. Log cribs are very time consuming to construct and resource intensive. They also create a structure in the roadway that can provide dismounts cover if fired upon. IMHO your time and resources are better spent on other obstacles. Don’t forget to take the basic tenants of obstacles into account when you look at places to put these in. If you don’t plan on dying in place then that slalom is going to slow you down getting down the drive and delay you long enough on a road that the threat is going to be able to close with you. That’s one of the characteristics of static defensive measures designed to delay or channel (reroute) a threat. They always work both ways. In the next entry we’re going to look at streams, creeks, ponds, and other bodies of water and how we can make them work for us. Till then keep building tribe and learn your ground. 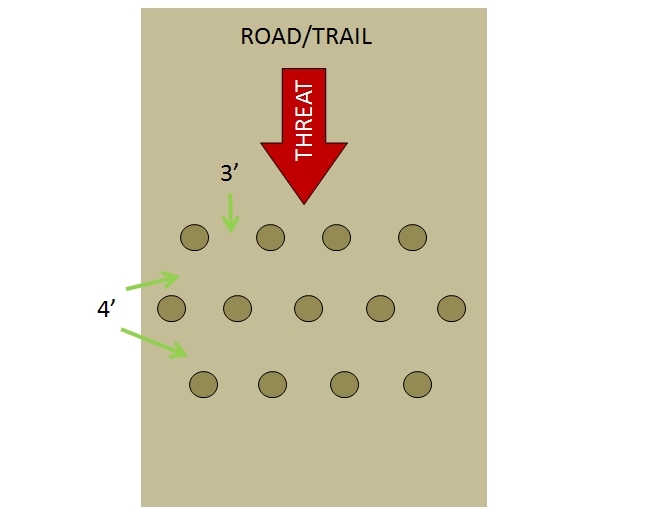 5 Responses to Defense – Obstacles Part V: More On Slowing The Threat Down on Roads and Trails. Rebar is cheap and easy to acquire. Driven into the road at an angle, and in the pattern you suggest, might be useful. Facing the direction of the vehicles entering the area, they might be difficult to see, as well, especially at night. Deep, wheel-trapping trenches dug across the road, covered with something light (1/4″ plywood or stiff cardboard perhaps?) with dirt and gravel scattered over them might also help, if arranged in a pattern like the hurdles. Wouldn’t hurt to place some rebar in the trenches, too.